The cream of Australia’s ITU triathletes and paratriathletes will converge on Yokohama this Saturday for the resumption of the World Triathlon Series and start of the World Paratriathlon Series in Japan’s second largest city. The event also herald’s the start of the road to the Tokyo 2020 Olympipc Games and the two-year Olympic qualification period for triathlon. It will feature the Australia’s Commonwealth Games team led by gold and silver medallist Jake Birtwhistle; Rio Olympians Aaron Royle and Ryan Bailie and a host of Paralympians and emerging stars with their sights set on returning to Japan for the 2020 Olympics. Birtwhistle, Royle and Bailie will be joined by Games young guns Matt Hauser and Luke Willian in a men’s field that will be led by defending WTS champion Mario Mola and Commonwealth Games gold medallist and Olympic bronze medallist Henri Schoeman. Hauser, a fast finishing fourth to Schoeman, Birtwhistle and Scotland’s Mac Austin who will also take his place in the field. “Coming off the back of the roller coaster ride that was the Commonwealth Games it’s been a tough road back to reality that’s for sure,” said Hauser. “But the thing that’s pushed me has been the challenge of my first Olympic Distance Triathlon in Yokohama. “I’ve been based on the Gold Coast preparing mentally and physically for my debut and the challenge is exciting in what will be my first WTS for the season as well. “I always love heading to Japan and it’ll be my first time in Yokohama which will be a pretty exciting place to be with 2020 just around the corner. After securing second place in the year’s first WTS in Abu Dhabi, Mola finished in fourth place on the beautiful yet extraordinarily tricky Bermuda course, but the double world champion looks confident in retaining the ranking leadership as he goes for a third straight win in the Japanese city. Mola will have to keep an eye on teammate Fernando Alarza, who proved in Bermuda that he should never be overlooked in Olympic-distance races. Alarza finished sixth after a frantic sprint to the line, beaten by mere tenths of a second by another one to watch in Yokohama, Frenchman Dorian Coninx. France’s U23 World Championship silver medallist is one of the stronger athletes through the run section, which can always prove decisive in this race. Most eyes will certainly be set on the rising stars to emerge from Bermuda: the Norwegians. There, they made history by becoming the first team ever to secure a clean sweep of a WTS podium, and Yokohama will see two of those stars racing again come Saturday; Kristian Blummenfelt and Gustav Iden. The women’s race will see Australia’s Commonwealth Games trio of Ashleigh Gentle, Charlotte McShane and Gillian Backhouse joined by the inform Emma Jeffcoat and Natalie Van Coevorden. “It will be my first time in Japan and the Yokohama WTS and I'm super excited to be here, especially off the back of a win in Chengdu World Cup last week,” said Jeffcoat. For Van Coevorden, after her first WTS podium, a bronze in Abu Dhabi, her preparation has been a case of all downhill. “The past month I have split my time behind home (Campbelltown), Wollongong and the AIS in Canberra,” said Van Coevorden. “Training has been building every week and I have been able to incorporate some downhill running back into my program which I found earlier in the year really worked for me. “I am looking forward to being able to demonstrate the hard work that has been going on behind the scenes. “Last year Yokohama showed me I had the ability to perform under some tough conditions and I came away with my best WTS result in years. “Leading into this weekend, I really wanted to maximize on opportunities that I have on Saturday and have confidence through all areas of racing with evidence from training and previous racing. McShane admitted she was disappointed with her Games debut but has put it behind her as she starts her WTS season. “This is my 6th time in Yokohama so I know the course and place very well,” McShane said. “I love coming back here as the people are so friendly and the course is always lined with spectators. “I took time off after Gold Coast to recover and refresh mentally and physically before I started my 2018 WTS season. “After a disappointing race in Gold Coast, I took some pressure off myself to enjoy training and the buildup leading into Yokohama and I’ve managed to hold onto some pretty good shape. All eyes will be on dual world champion Flora Duffy as she lines up again after her Commonwealth Games gold medal, and spectacular win at the inaugural WTS Bermuda in front a home nation. The Americans have sent a strong team that includes current series leader Kirsten Kasper, Katie Zaferes and Summer Cook. But the crowds will be cheering loud and proud for Juka Sato, Juko Takahashi, Juri Ide and veteran Ai Ueda. The Paratriathletes will kick start the busy day with the opening round of the ITU World Paratriathlon Series attracting Paralympic and world champions. For the second year running, the Australians will be among the best paratriathletes from around the world who will compete in the first event of the revamped calendar over a sprint distance race along the picturesque Yamashita Park. Gold Coast Games silver medallist Nic Beveridge will line up in an all-star PTWC race against Dutch Paralympic champion and two-time world champion from Rio Jetze Platz and England’s Commonwealth Games champion Joe Townsend. 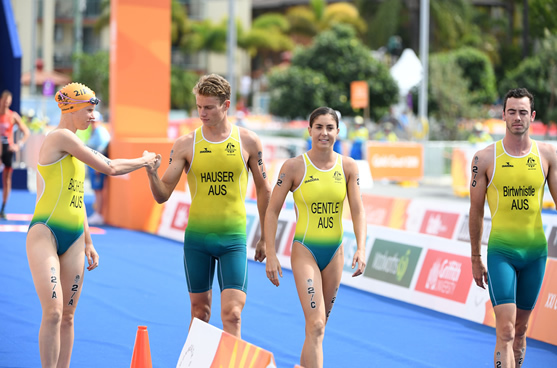 Beveridge finished second to Townsend in last month’s history-making Commonwealth Games paratriathlon debut on the Gold Coast, with five-time ITU World champion Bill Chaffey taking bronze. In the female category, Australia’s Commonwealth Games bronze medallist Lauren Parker will be joined by Games team mate Sara Tait with Spain’s Eva Maria Mortal Pedero wearing the number-one bib. Two-time world champion from WA Sally Pilbeam will feature in the PTS4; Jonathan Goerlach in a strong line up of PTVI men and Brisbane’s Josh Kasulke in the PTS5 men, WA’s Brant Garvey in PTS2 and ITU world championship medallist Justin Godfrey in the PTS3 category.